Photography and Text By Michael J. Kelly © All rights reserved. A low murmuring and the rustle of wet rain gear woke me from a light sleep. The French group had returned to the Diesel Hut, our base camp, after an unsuccessful summit attempt. 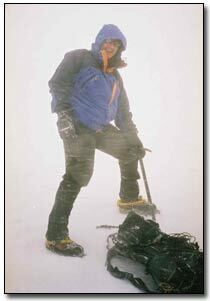 High winds, poor visibility and horizontal hail at 5,000 meters had forced their retreat. Nothing new, no one had summitted in the past month. I rolled over in my sleeping bag, slightly dejected. We had spent a week acclimatizing, and were running out of time. If the weather didn't improve in the next two days there would be no summit for us either. 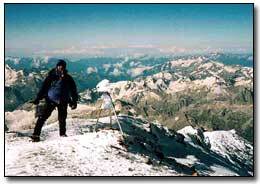 Despite Mont Blanc's fame, Mount Elbrus, at 5,642 meters above sea level is in fact Europe's highest mountain. Set in the Caucasus range of mountains sandwiched between Russia and Georgia it lies on the European continent and extends significantly higher than Mont Blanc's 4,810 meters. Although considered by serious mountaineers to be nothing more than a "snow plod", the mountain is a challenging undertaking and claims a number of lives every year. 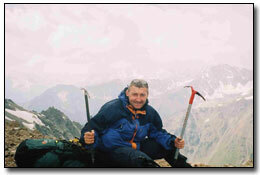 In the month prior to our trip at least five people were reported lost or dead on the mountain. The acclimatization hikes had done their job and none of us were suffering any effects of altitude sickness. A greater risk was lurking just outside the hut however. The toilets outside the hut at base camp are infamous. Two wooden shacks side by side with drop holes that, defying gravity, allow matter to fall up as well as down. Key decision factors in the choice of which toilet to use are wind speed and direction. Choose the wrong one and you may end up drenched in your neighbors liquid waste! Having been forced to spend three days at the Diesel Hut due to the weather we were keen to get going and have a crack at the summit. The return of the French group, an apparently strong group of experienced climbers, was therefore all the more disconcerting. The following night was our last chance to attempt the summit, and their defeat at the hands of the mountain did not bode well for our ascent. The alarm didn't even get a chance to sound. It was 1am, I had been in bed since 9pm, but hadn't slept a wink. Nor had any of our group by the sounds of things. John had caught a stomach bug the previous day (the toilets caught the blame!) and was looking distinctly green. The eight of us dressed quickly and silently and slipped down the steps to the kitchen for what was an extremely early breakfast. I decided to brave the terrors of the hut "facilities" and wandered outside. Looking up at the stars sparkling in a clear sky, I couldn't believe our luck. I was looking at the first clear sky over Elbrus in a month. It was too good to be true! "Well God, are we going to make it tonight?" I asked skywards. A shooting star shot from right to left in response. I remembered my classics studies, good omens come from the right, bad omens come from the left. Slightly spooked, but certainly cheered, I concluded my celestial inquiries and returned to breakfast. For the sake of esprit de corps I had to swallow my pride earlier that day. A vote had been called on whether we should hire the "SnowCat", a Caterpillar vehicle, to take us to the Pastukhov Rocks (4,700m), thus saving us an hour's hike, or start the ascent from the Hut. The Purist in me rejected the SnowCat as cheating, but the others concluded that as we had already done that part of the mountain the previous day, we should simply take this shortcut. Outvoted seven to one, I was forced to relent. At 2am the SnowCat arrived, people and rucksacks piled on and soon the Diesel hut was lost in the darkness. After a painful 15 minutes being carted uphill at a 45 degree angle, the deafening noise of the engine dropped signifying our arrival at the Pastukhov rocks and we could all winch our way free of the contraption. Ice axes were unlooped from bags, crampons were booted and with a silent air of concentration the ascent proper had begun. The first two hours of the climb are quite steep and strenuous. The scrape of crampons from ahead gives advance warning to "kick in" harder to avoid a slip. A reassuring "crunch" of crampon and ice-axe confirms that you kicked in hard enough and at the right angle, so you're safe for the next three seconds at least. 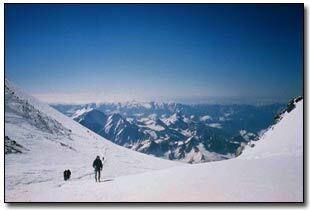 Recovering from slips and stumbles is exhausting at this altitude, and is to be avoided at all costs. After three hours climbing through the black and white moonlit landscape, we reach 5,000 meters and the route levels off. As we reach the Saddle the sun bursts over the mountains behind us and we are treated to a mesmerizing sunrise over the pristine white landscape. Although the climbing is now easier, the first hardships of operating at this altitude begin to impact on our little group. John's stomach upset has reduced his energy to the point where he can no longer continue. Even with the sun now up and wearing plastic boots, Stuart gets frozen feet and can no longer feel his toes. Fearing frostbite, he decides to turn back and try to catch up with John on the return. Susan is suffering dizzy spells, bringing difficulty in balance and focus. James has to make a run for it and let loose his diarrhea virtually in full view of us! Having previously been through similar experiences on other climbs, I have settled into a routine and am thankfully not suffering as I have before or as my compatriots are now. My world is now limited to the footprints of the person in front of me, encircled in a pool of light cast by my headtorch. I try not to look around too much, as a stumble on the snow combined with a strong gust of wind would be certain to throw me off balance. I focus on my breathing and pace, making sure that both are in sync, so that my heart rate is steady. At this altitude the slightest deficiency in air to the lungs can have a serious impact on your heart rate, and therefore performance, within seconds. I am also drinking as much fluid as possible even though I'm not thirsty. 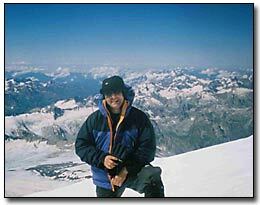 Dehydration is a major factor in altitude sickness, and I know that shortly the tube running from the bladder in my rucksack to my mouth will freeze and it will not be so easy to hydrate. Nonetheless, I can feel the pounding in my head increasing, and know that the slightest increase in heart rate will bring on a very painful headache and nausea. At 5,200 meters I start to grow concerned about the fact that I haven't been able to feel my toes for the last half hour. I take off my boots and Gia, our guide, whips them with his mittened hand until I can feel pain again. Pain, it seems, is good! Strangely, I actually start to feel better the higher we go. My body seems to be adapting more quickly than usual to the altitude and at 5,400 meters it is clear that I am suffering the least of the entire group. Even Andrew, my marathon running friend, now seems to be suffering and I sit with him for some time while he re-energizes. It is a perfectly clear morning at 9am local time. We are standing on the top of Europe and can see for miles. We embrace and congratulate each other to the sound of our camera clicks, and for a short time savour what must surely be one of the most impressive views in all of Europe.